Jovial spokesman for Hotels.com Captain Obvious is getting caught up in election fever. So much so that he's running for president. How? By litchrally running across the country. The master of pointing out things that seem clear as day will be providing commentary on what has already been a fascinating election season. Of course, simply making clever remarks is one thing, but what if you want to follow along with Captain Obvious' journey? Head over to the "Captain Obvious Runs for President" microsite, where you can see which states our presidential hopeful has visited, as well as pick up some collectibles and goodies. Because merch showing off your favorite candidate is a must. 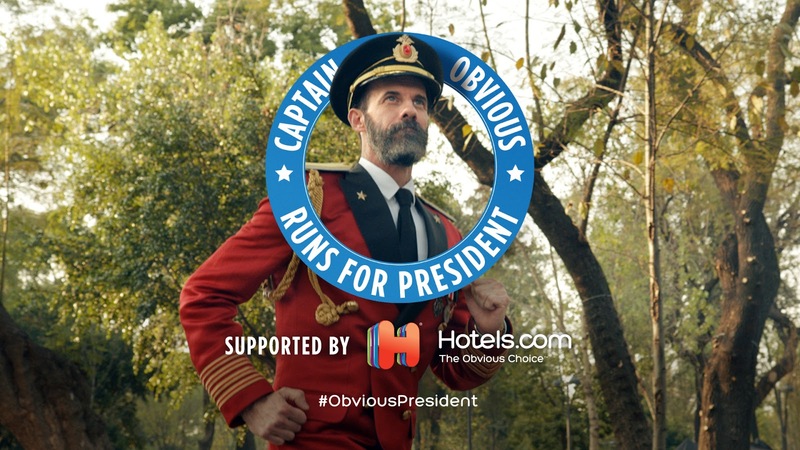 Hotels.com is supporting their main man Captain Obvious during his race because they believe in simplicity as much as he does - and more importantly, he'll need a place to rest at night. Have you ever tried running across the country? It's exhausting! Hotels.com will provide the Cap'n with shoes, socks, shorts, and all the other gear you could need for a lengthy run. Having done one marathon in my life, I'd recommend a water belt and vaseline for ankles and hips. Chafing is never fun. As any good presidential candidate should, Captain Obvious is welcoming feedback on his campaign. Follow along on Twitter using the hashtag #ObviousPresident to keep up on the latest news and commentary, as well as interact and engage with the Captain. The best part about all of this is that you don't need any running experience at all. If I can enjoy a good run from the comfort of my sofa while noshing on a Reese's egg, I'm all for it.